BEAM Compare is a browser-based compare tool separate from PeopleSoft Compare, Application Designer, or migrating objects. As before, new release compares data - and the underlying data structures across PeopleSoft Environments. When PeopleSoft customers initially hear the name BEAM Compare naturally their first thoughts are about PeopleSoft Compare and compare reports. We often find ourselves entangled in a not-really-relevant-to-us discussion about "six feet of reports" and other sidetracks. While both BEAM Compare and PeopleSoft Compare work "across environments" that's about the only thing they have in common. PeopleSoft Compare is focused on comparing objects. It provides compares within the context of preparing and then migrating database definitions. It is a developer's tool, and requires special access. 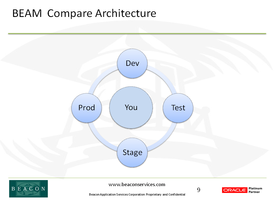 BEAM Compare is focused on Comparing data and data structures across environments, applications, releases, and platforms. It quickly identifies and reports differences in data, or in the data structure. BEAM COmpare may be run in a browser by it or analysts. BEAM Compare compares data and structures between any environments, and our new release (coming out in August) does not stop at comparing data and identifying differences. Release 3 will offer customers a variety of ways to (optionally) take action on data, including automating the creation of Data Mover scripts to reconcile identified differences. Alternatively, we also can download differences to spreadshhets (which can be loaded to another environment through BEAM Test) or used as a worklist for manual updates. We've also added complete PeopleCode and SQL Object compares. These two items were the top requests from users and prospects. And we've added "Compare where" methods so that customers will be able to dynamically define specific values to compare. For example, instead of comparing all employee (or bank, or student) records, a value to identify a specific student, bank account or Vendor ID value can be provided. Just about everything in PeopleSoft is (eventually) data. Record values, table structures, PeopleCode, Trees, security objects, SQL objects, components, pages - they are all stored in tables, as DATA. And BEAM Compare can compare or verify all these data/objects, across environments, quickly and comprehensively. BEAM Compare runs in its own separate environment, isolating BEAM's code. BEAM has no footprint in any of your dev or production environments. And beacuse it is in its own instance, it has no performance effects on production oryour other environments.